Hang in there – we’ve almost made it! One more month and it will officially be spring. Finally! I don’t know about you, but I’m so done with the icy temperatures. Lately, I really noticed how the weather conditions affect my skin. Time for some extra pampering! Let’s make the best of the last winter days with proper skincare. I want to show you five current favorites, which are perfect for our dry and dull winter skin. If you are a combination skin type like me, you’re probably not too keen on cleansing oils. No more extra shine, please! But in winter, there really is nothing better to clean your face with. It’s soothing, moisturizing and calming. As my skin tends to be more on the dryer side now anyway, it handles the use of oil very well. I usually use my beloved cleansing oil by Origins in the morning. Ever since I started using this cleanser, I have noticed redness disappearing and a smoother make-up application. Even oily types could use this one, as it doesn’t feel extremely greasy and lathers up with water very nicely. Actually, this one is one of my all-time favorite beauty products. 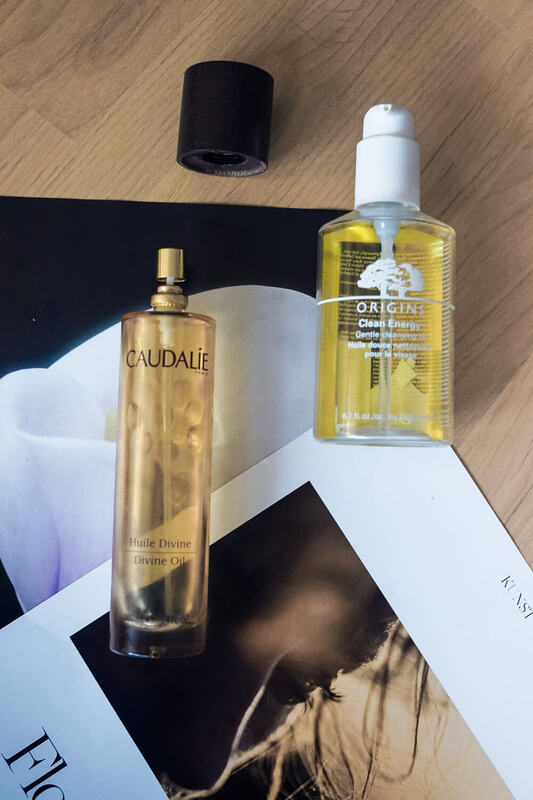 I use the Caudalie Divine Oil for my hair, my hands and my body. It’s a very light oil that absorbs quickly into your skin, leaving it moisturized and glowing. The smell is incredible – light, floral, not too sweet. I still love it after several years of usage. Plus, the bottle lasts forever, as you only need a few drops of this wonderful product. It contains a mixture of argan oil and hibiscus oil which are amazing at nourishing the skin. A face serum is one of my winter beauty staples. I recently discovered this Weleda skin treat and was convinced after the first application. I use it every other day at night, when my skin needs a bit of extra love. It is very good at smoothing out fine lines arising from dryness. In general it makes your skin more plump. Maybe that’s why it’s supposed to work very well for mature skin, too. 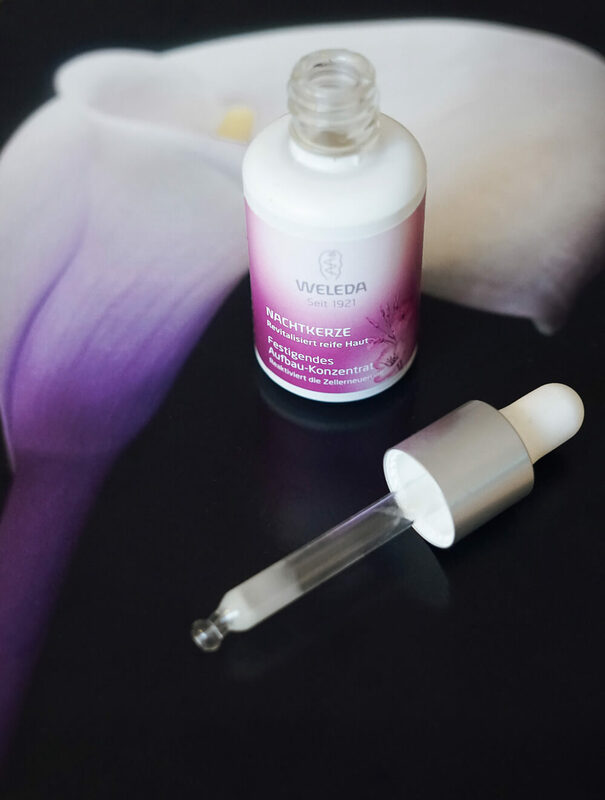 Unfortunately, it’s not easy to get your hands on Weleda products outside of Germany. If you can – it’s worth it! They offer only natural ingredients and for an eco-brand, everything is decently priced. 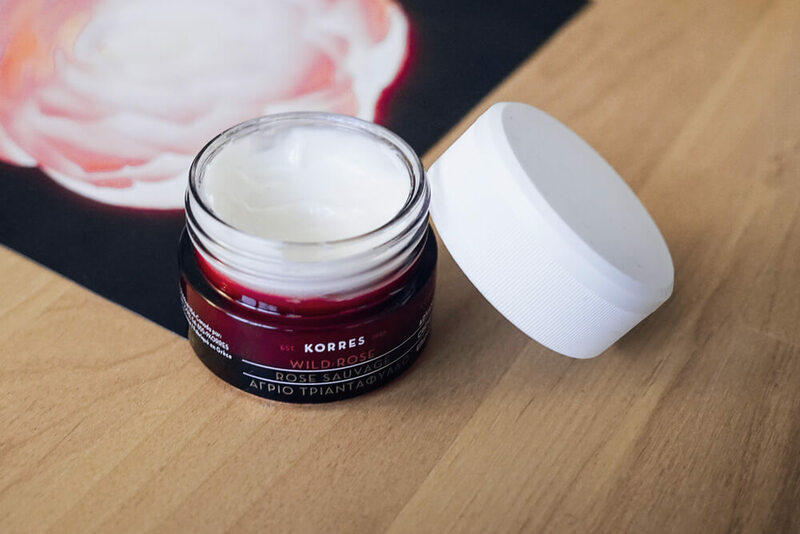 I have collected a few skincare products by Korres and they convinced me. Their Wild Rose Sleeping Facial is one of my favorites! You’re supposed to use it in the evening, as it contains vitamin C, which makes your skin more sensitive to sunlight. I love how my skin looks in the morning: glowing, smoother and brighter. If you have problems with hyperpigmentation, this is perfect for you! It does a really great job at lightening dark spots. The night cream also contains aloe vera, which we all know is a perfect ingredient for skincare products. 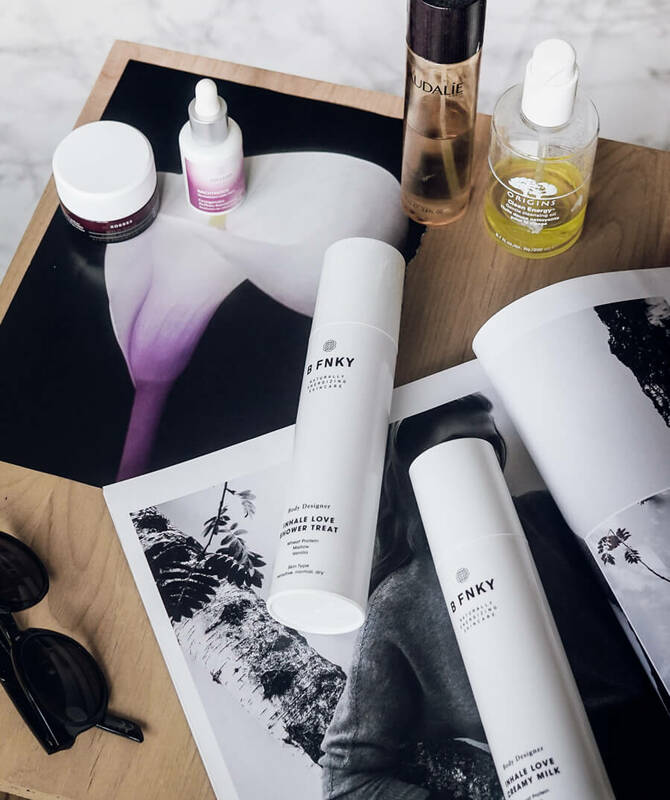 Attention, attention – new skincare brand discovery! 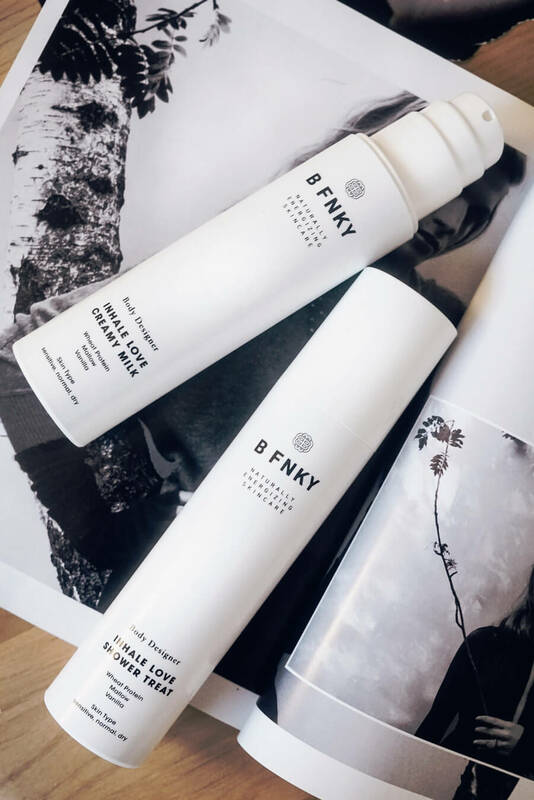 B FNKY is a brand new German eco-brand, which focuses on producing high-quality beauty products. As a plant-based eater, I was very excited about trying out some of their vegan products. The moisturizer and shower cream of their Inhale Love range both* have a slight floral scent, which is hardly detectable. They both get bonus points for coming with a pump – something every skincare product should have, if you ask me! What I like most about them is how they add moisture, without heaviness, which is so rare to find. I can’t wait to try more of this modern eco-brand! *these products were sent to me for free. This doesn’t affect my opinion.